Testosterone replacement therapy (TRT) is the medically tailored use of testosterone preparations, in accordance with their prescribed dosages and frequency of treatment. Although TRT is expressly designed to treat testosterone deficiency, and its accompanying symptoms, testosterone preparations serve a variety of different purposes. Testosterone injections are by far the most popular overall preparation used by TRT patients, bodybuilders, athletes, and recreational users. Testosterone injections also include hybrid blends of slow, moderate, and fast ester testosterones such as the legendary Sustanon 250, and it's similarly composed relative Omnadren 250. These two products are optimally taken frequently early in their administration to benefit from the short esters, and then less frequently later once the long esters have had enough time to accumulate within the bloodstream. Medication injections that are shot directly into the bloodstream are called intravenous or IV injections. This is a very deliberate and intentionally performed injection that usually begins by searching for the best vein, and ends with a sideways injection into it. This is not the procedure used for IM injections. IM treatments are never injected intravenously, as this can have very immediate negative and potentially fatal consequences. Testosterone injections are only intended for intramuscular administration, meaning the needle has to go through the skin and fat layers, on into the muscle tissue. The favored testosterone injection muscle groups include the buttocks, the outer quadriceps/thighs, and the lateral (top outside) surface of the hips. Other less popular muscle groups are often used when frequent shots are necessary, and include the deltoids (shoulders), calves, pectorals (chest/breast muscle area), lats (latissimus dorsi muscle), biceps & triceps. The 'Two-Pin' technique provides the highest level of sanitation. You would draw (extract the testosterone) with the first pin/needle, change pins, and then inject with a new one. This procedure prevents contaminants that may have remained on the drawing pin, from being introduced into your body via the injection site. It also reduces injection pain, as the drawing needle is necessarily dulled during passage through the rubber stopper on vials, or scraping on the ampoule bottom. A dulled needle can increase injection pain by not piercing the body as cleanly as an unused one. 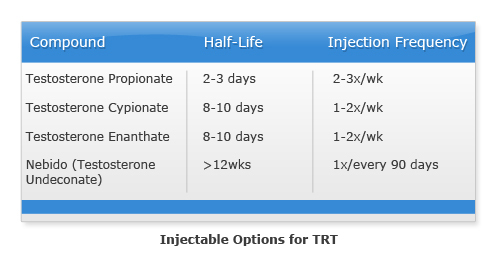 The following protocol should be used for testosterone injections from multiple dose vials, while steps 4 - 8 can be disregarded if you're using ampoules (also called ampules). A shower is highly recommended. If one is not taken, then wash your hands thoroughly with soap and warm water. Thoroughly cleanse (with soap), rinse, and dry the injection area. Sanitize the injection area with an alcohol swab. If using a multiple dose vial, be sure to clean the rubber stopper with alcohol in order to prevent contaminants from entering the vial when your needle passes through it. Fill the syringe with the same amount of air as your intended dose. Inject the air into the vial (a practice that helps maintain the balance of internal pressure, thereby making future withdrawals easier). Holding the vial upside down, draw solution into the syringe and remove the needle. Continuing to hold the syringe pointing upwards, replace the needle cover, and unscrew the used needle. Leaving the protective cover on the new (sterile) needle, screw it into place. Relax the injection site, and while holding the needle like a dart, insert it with one swift motion all the way to the end of the needle. This step varies depending on the size of the needle, and the depth required for the selected injection site. Be sure the needle is long enough, and inserted far enough to reach your muscle tissue. Do this at a 90 degree angle relative to the muscle being injected, as a 45 degree angle may not permit full passage through the fat layers. Then aspirate, which means to pull back on the plunger to confirm that you're not lodged in a vein, i.e. blood is not entering the syringe. As long as no blood has entered, proceed by depressing the plunger with slow steady pressure. Once the syringe is empty pull the needle out with one swift motion, put pressure on the area with a sterile alcohol pad, and massage in a circular motion. If desired, apply a bandage. Recap the needle, and dispose of everything in a safe manner.